On the Occasion of Mother’s 92nd Birthday – Amy Lyles Wilson, M.A., M.T.S. When my precious mother turned 80 in January 2002, my sisters and I hosted a lunch in her honor at the small church my parents had helped found in 1956. 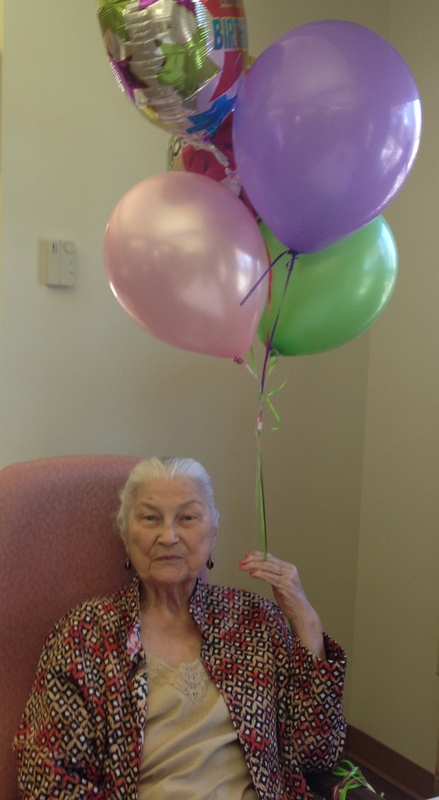 There was chicken spaghetti and cake, flowers and balloons, and lots of love for my mother. People told us how much she had meant to them over the years, shared stories about my sisters and me, and remembered my father, who died in 2000, with affection. Mother stood up and thanked them, cried a little when talking about Daddy, and made sure folks got second helpings. This year, Mother’s birthday looked different. She’s 92 and living in a care facility, diagnosed with dementia. There was cake and and pink lemonade, flowers and balloons, and lots of love for my mother. My sisters and I didn’t know if the residents would want—or be able—to sing, but one of them started belting out “Happy Birthday” so we joined in as best we could. Mother stood up and thanked them, smiled over at her three girls, and made sure folks got second helpings. That’s really sweet, Amy. I enjoyed reading your words, as always. I find myself watching Mom with a wonder of what it will be without her someday. I only started that this past year. Shewwwww. This is tough stuff, Diana. Thank you for sharing part of your story with me. Best wishes to your Mom and all you all. Loved how this came around again giving us “seconds”. . . Thank you, Patricia. I’m trying to blog more regularly. I hope all is well in your world. Such a sweet article. Thanks for sharing. Thank you, Martha Grace! You helped make that day special. You and Robert and Matt. A wonderful set of images of both change and the consistency of love. Thank you, Tomas, for taking the time to read and comment. I like that, the “change and consistency of love.” (May I use it?!) Such a fine line becomes all the more apparent to me with each passing day.